It can be difficult to find a really ripe pineapple, and then it is difficult to peel and serve. There are two fine replacements for a fresh pineapple - frozen and canned. Do not buy the pineapple which is canned in sugared syrup. We want to avoid giving baby added sugar for as long as it is possible. Frozen pineapple and cans of pineapple will store well and can be used when you run out of fresh fruit. These are good items to keep around for the end of your shopping week. Buy fresh, canned, or frozen. A fresh pineapple to be ripe, has to be ripe when picked so it can be difficult to find a good one. Look for ones that smell good and are still firm. To cut up a pineapple, chop off the top, slice off stem end, and cut pineapple into quarters. If you have a grapefruit knife, use to separate flesh from skin, or use a paring knife. 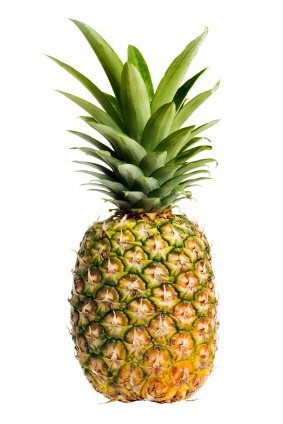 Some children really like eating frozen pineapple, so don't waste time defrosting! Cut into age appropriate chunks. A cut up pineapple will keep for 10 days in the bottom of the fridge. No, they have a tough skin so it protects it from pesticide contamination. Pineapple is one of those foods that should just be eaten fresh or made into fruit salad. It is delicious to mix with cottage cheese.